Glorious sunshine greeted runners at the northern road relay championships in Manchester, a far cry from the dismal conditions at Delamere two weeks earlier. This time the course was truly road relays, meandering around the perimeter of the Etihad stadium and the campus of Sports City. 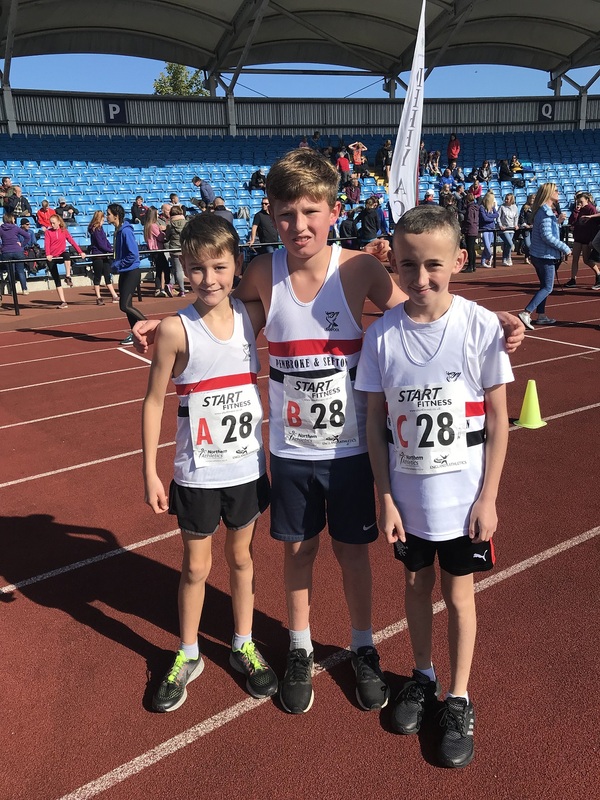 The younger age groups all ran a distance of 3.1K and first up was the U13 boys. 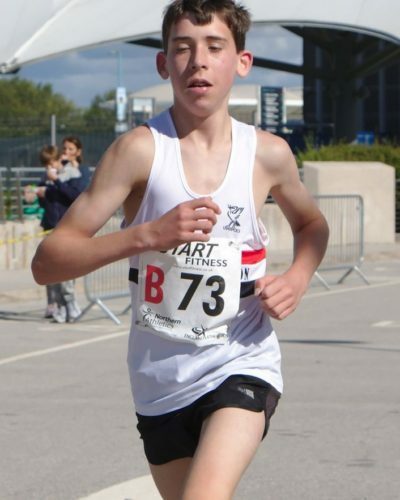 They were led off by the diminutive Zac Dickinson who put all his efforts into bringing the club home in 16th place (13.22). The other two team members, Conrad Lucas (15.06) & Evan Williams (14.15) couldn’t keep this going and the team finished in 22nd place. The club had three U15 boys teams. Mark Roberts led off the ‘C’ team, but was out of sorts and laboured home (13.20) in 42nd place. Se Loughlin made a determined effort to make up the deficit & his time of 12.25 was good enough to make up 14 places before handing over to Jake Dickinson. 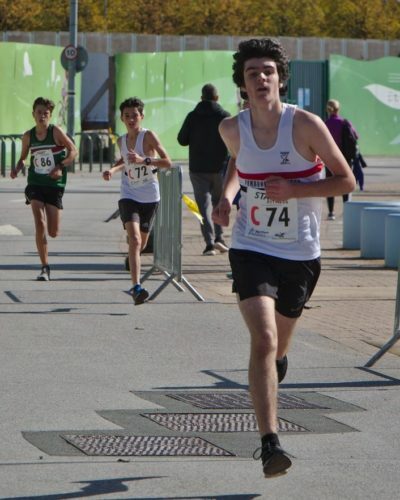 Jake took the race by storm to record the 4th fastest time of 11.35 to bring the club home in 19th place. Only 30 sec behind was the ‘A’ team of Oscar Davidson (12.20), Gideon Lucas (12.57) & Michael Henderson(12.33) who finished in 21st place, followed in 23rd by Stanley Benson (12.29), Nicholas Usher (13.17) & Harry Wright (12.35). These were excellent runs by youngsters still eligible to compete in this age group next year. The best team performance of the day was from the Senior Women who ran 4 legs of 3.7K and came a very creditable 8th place out of the 97 teams who finished. Kirsty Longley pushed hard from the start to finish 6th (21.13), before Rosie Johnson (22.13), Helen Saghal (23.58) and an excellent run from Tiffany Penfold (22.19) who fought off a challenge from GB international Jessica Judd. The club also competed a ‘B’ team thanks to Vicky Gilbody (24.48), Harriet Foley (28.36), newcomer Laura Purdy (26.38), with Hilary Honeyball (23.51) making up the quartet. The men’s teams were not at their strongest, but there were still some good individual performances. Their event was 6 stages of 6.8K and the ‘A team finished 44th, in a very competitive event with 127 teams finishing. Luke Edwards (22.34), Ross Harrison (22.19), Mark Wynne (21.51), Richard weeks (24.09), Bernie Murphy (23.51) & Andy Foster (24.11) made up their team, with Mike Gall (23.52), Paul Milburn (24.04), Sean Kirkbride (29.15), Richard Beesley (24.53), John Dickinson (26.36) & Peter Gaskell (25.52) making up the ‘B’ team. ← Dan wins bronze on gold coast.